Since Ohio State University’s declaration of a national student boycott of Wendy’s at last month’s Concert and Parade for Fair Food, word of the student-led action has spread to university campuses across the US! 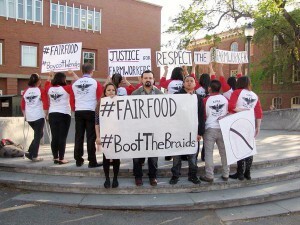 From the east coast to the west, students have grown tired of waiting on Wendy’s to make a real commitment to farmworkers’ human rights by joining the Fair Food Program. And last month’s news of Wendy’s unconscionable decision to cut-off tomato purchases from Florida altogether was the last straw, spurring students to declare, campus by campus, that they’re ready to cut their own purchases entirely from the fast-food chain until Wendy’s signs a Fair Food Agreement. And so, hundreds of students on more than a dozen campuses organized a National Weekend of Action in the Wendy’s campaign this past weekend. In addition to spirited pickets and manager letter deliveries from Florida to California, two new universities, the University of Michigan and Georgetown University, used the weekend as a platform to officially declare a student boycott against the fast food chain. For more details and photos from the weekend, here’s the full report from the Student / Farmworker Alliance! This past weekend, students from over a dozen universities picketed, flyered, marched, and delivered letters to Wendy’s locations across the country in support of the Wendy’s student boycott that was declared last month. Members of Rio Grande Valley (RGV) SFA marched from the University of Texas Pan American campus to a nearby Wendy’s. Meanwhile, students from M.E.Ch.A. de Washington State University, fresh from M.E.Ch.A. 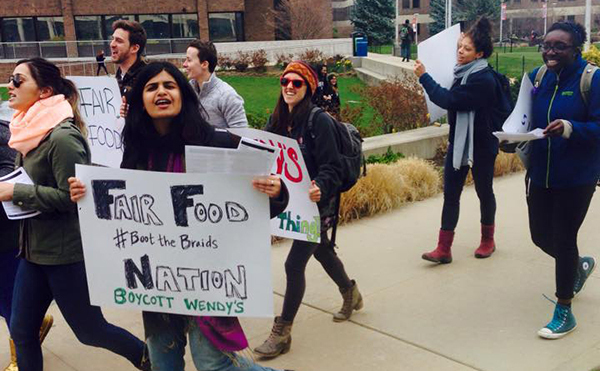 Nationals — which just two weeks ago took on the student nation-wide boycott of Wendy’s! — headed over to the fast food joint to deliver a manager letter. In Wendy’s home territory, the students from Ohio State University who officially launched the boycott organized not one, but two actions during the week, in conjunction with Real Food Challenge. Still carrying the energy generated by March’s Concert & Parade for Fair Food, a group from SUNY Stony Brook marched through the heart of campus to the Wendy’s, carrying the message that students’ call for the fast food chain to join the CIW’s the Fair Food Program will only keep getting louder! Following OSU, students at the University of Michigan in Ann Arbor used the big weekend to announce that they will be the next university committing to no longer spend their money at any Wendy’s location — including the two on campus — until the company signs an agreement with the CIW. Buoyed by the energy and animo from the weekend’s surge of action, the semester is ending on a high note for Student / Farmworker Alliance and plans are underway to continue spreading boycott efforts through the summer. Citizens of Asheville to Publix: Expand your commitment to human rights if you want to expand into our state!